Hi, I’m Here for a Recording. From “I’ve got an idea for a book” to “you can buy my book on Amazon” is a long journey. I start the journey in my head quite a few times a year, but only some ideas become something you can hold in your hands. Usually I take about a year to complete a book: from the moment I’ve decided that the idea is meaty enough to turn into a paperback (albeit a slim one, my books tend to be around 100 pages long) to the complete, edited version. However, “Hi, I’m Here for a Recording. The ordinary life of a voiceover artist” will have a shorter gestation period. The main reason is that I have so much fun writing it, and it’s so easy to get the pre-first draft down, that I need to get it out of the way before I tackle anything else. So, in a way, I’m writing it to make head space for other projects that require a lot more effort. As the book is my personal story through the world of voicovers (through London, Edinburgh, a bit of Amsterdam and other stories around my freelance life) every now and then I do doubt whether I will finish it. After all, who would want to read it? Is it interesting enough? And my main current block: what structure should it follow??? But now, there’s no turning back because I HAVE THE BOOK COVER! And that is the moment when you know you have to complete the book. Someone else has spent time on your project and that means this is no longer just about you, which, for me, is a great way of making me step up a gear. So here it is, the new book cover, by the wonderful Silvina. If you like the cover, have a look at her blog, www.pencilory.com. The blog is full of colourful illustrations in a very distinctive style, most of them inspired by what’s going on in Silvina’s life (or head!). If you look at the right-hand bar on this blog, you will see that I have worked with her before, mainly on illustrations for the blog Virtual, not Distant. 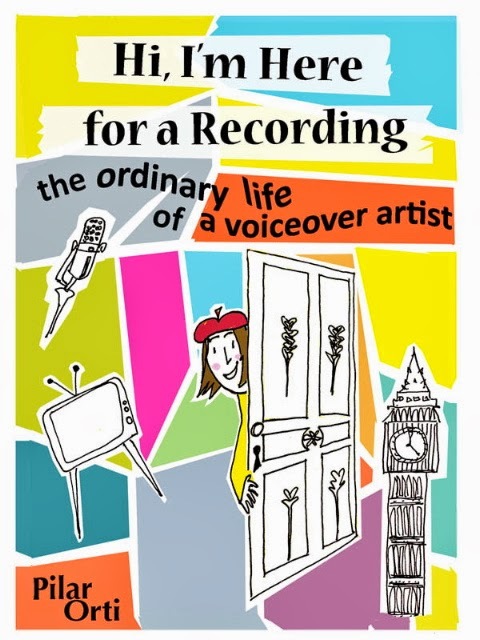 If you would like to know when “Hi, I’m Here for a Recording, the ordinary life of a voiceover artist” is released, enter your email address in the box below.